During this presentation entitled, “What Would You Do? 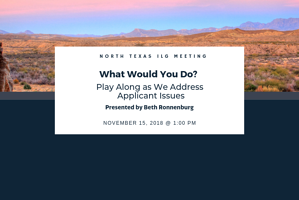 Play Along as We Address Applicant Issues,” attendees will have a chance to discuss and share how they would handle each scenario from multiple perspectives and learn the pros, cons, and impact of each approach. The answers to the complex compliance issues that attendees face on the job are rarely cut and dry, and participants will leave this meeting with a better understanding of the comprehensive thought process that needs to occur when addressing applicant tracking and management. This meeting will be held on November 15, 2018, at Essilor of America in Dallas, TX, at 1:00 p.m. The meeting is open to the public but please keep in mind seating is limited. RSVP to northtxILG@gmail.com to reserve your seat.